This content was originally published in the Indianapolis News on May 31, 1911. A key figure in the most spectacular accident of the first Indianapolis 500, Harry Knight was also hailed as something of a hero. 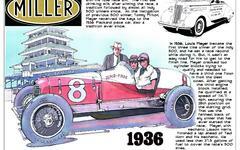 After Joe Jaggersberger's Case broke a steering knuckle his riding mechanic, Charles Anderson tumbled out onto the brick-paved Indianapolis Motor Speedway home stretch. In front a stunned sold-out grandstand crowd, Knight violently swerved his Westcott #7 racer to avoid hitting the stricken Anderson. He succeeded in that effort, but found himself spinning out of control into the Apperson of Herb Lytle in the pits. This accident was blamed for much of the scoring errors that plagued the race as inexperienced judges and scorers allowed themselves to be distracted like the typical freeway rubbernecker at the scene of an accident. This is more of an image than an article, but the cutline is informative.